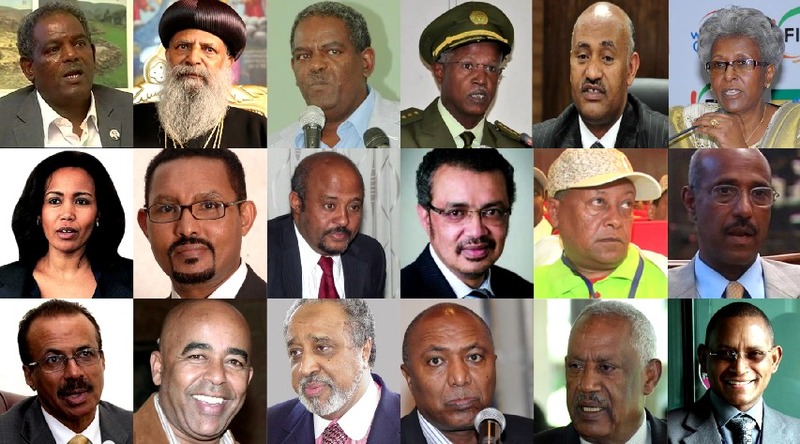 TPLF’s New Ministers Are Puppet’s Made for Television and International Aid. Note. 100% Ethiopians plus 2% TPLF amounts to 102%. TPLF never believed it is an Ethiopian and its ultimate goal is to establish “Tigray Republic”. Yesterday, we all heard that the Tigray Peoples Liberation Front (TPLF), that hails from the 6% Tigreans, has given some power to the 96% non-Tigrean Ethiopians. I call this the never ending TPLF drama. What we should know, for fact, is TPLF started by doing drama and will end doing drama. The reality is there is no way TPLF will share real power with Ethiopians because its nature does not allow it to do so. TPLF thinks it has defeated the 96% non-Tigrean Ethiopians by the barrel of the gun. Hence Ethiopia remains its war turf until Ethiopians get the courage to dispose it through the barrel of the gun. When that happens TPLF’s plan B, to declare Tigray republic under article 39, kicks in. Few months ago there was an interview on Ethiopian Satellite Television (Ethsat) with a person who was the security guard of the late Ethiopian president Meles Zenawi and later to his prime Minister Tamrat Lyne. Remember Meles and Tamrat Lyne were president and Prime Minister respectively. He said all five hundred employees of Meles Zenwi’s office, including the Janitor, were Tigreans. If you are Amhara or Oroma you are not allowed to work in that office. Imagine, to think a government that harbors such level of distrust and hate to other Ethiopians will share real power with them is nothing but wishful thinking. I doubt, even after the death of Meles, puppet prime minister Desalen Hailemariam was able to change anything in that office. It is not because he does not want to, his job description does not allow him to do that. Hence, recent TPLF’s claim of power sharing is a drama for the following reasons. 1. In the current TPLF’s government, the body controls the head, not the reverse. Federal government is the instrument that Tigreans heavily rely on to rule the whole Ethiopia. Thus, like Meles’s office all ministries are staffed by Tigreans. When the minister is non-Tigrean, there is a Tigrean vice minister in the office. That tells you the minister is placed to show the international community, up on which TPLF depends for aid, that there are non-Tigreans in the TPLF government. However, the real minster is the Tigrean vice minister. For instance, in the Defense ministry Siraj Fergessa, who is from the Oromo Ethnic Group, is the defense Minister and Tigrean Samora Yonus is the vice minister. However, in realty Samora Yonus is the minister and Siraj Fergessa is the vice minister. Siraj accepts orders from Samora. In fact, in one of the evaluations, SiraJ was criticized of being too scared of Samora. For that matter, because the defense ministry is full of Tigreans, there is no way Siraj could have his own followers inside the ministry. With no followers Siraj is Samora’s puppet made for Television. 2. Security, Police, Defense and Communication are still under full control of TPLF. When a government wants to oppress its people, the four things it needs is security, police, defense and communications. In the current government all three important government positions are under full control of TPLF. In fact, last week a previous official of the TPLF Spy agency gave a testimony to Ethsat that in the pretext of work force reduction TPLF laid of eleven thousand Telecommunication Employees and replaced them by Tigreans whose sole job is to spy on Ethiopians who are exchanging messages on the phone and social Media. Do not forget that currently TPLF is using all four government institutions to crash the 96% Ethiopian’s opposition to its 6% Apart-tide Minority rule. 3. It is a cover for sharing the blame on TPLF barbaric act against Ethiopians. If you are adult enough to remember, few weeks before Mengistu fled to Zimbamwe he presented a cabinet of Ministers who were very diverse and most of them out of the Military Junta. The objective was to wash Mengistu’s seventeen years of crimes by the new faces. What TPLF is currently doing is the same. The massacre, arrest and subjugation of Ethiopians led by Samora Yonus, Getachew Assefa and Debetsion Gebremicael is going to continue until TPLF is thrown out of power. Till then the new non Tigrean ministers will be ordered to apologize for the TPLF crimes by appearing on TV Screen. You will not see Samora , Getachew or Debetsion apologizing for it. Instead they are going to send their puppets who are made for Television. 4. The Tigrean ex-ministers will stay around. Even though they are not in government structure any more, why do you continue to see Sium Mesfin, Sibhat Nega, Abai Tsehaie and Bereket Simon representing the government in very important meeting. That tells you that there is a secret party that orders prime Minister Hailemariam Desalegn what to do. TPLF does not need power sharing. It wants puppets who give the international community the impression that TPLF is ceding power to non-Tigreans. Because most of the Ethiopian budget comes from Aid, TPLF needs to do that Drama for its survival. Over all, the current TPLF drama is similar to the 2005 election. The 2005 election drama was made not to give power to non-Tigrean Ethiopians but to mislead the International community to believe that Ethiopia was holding a multiparty election. Fortunately, the sham election did not end that way. When the opposition parties won the majority of the vote, TPLF resorted to vote stealing. When Ethiopians opposed TPLF’s Vote stealing activities Meles Zenawi declared the security, police, defense and off course Telecommunications were under his control. Accordingly, he killed more than 200 people and arrested 50,000 to crash the opposition. Later the opposition groups that won the election were sent to prison. That is why the long defeated TPLF is still holding power in Ethiopia. Therefore, it is important for every Ethiopian to learn from History. That is current TPLF’s power sharing fanfare is nothing but a drama of puppets made for television and International aid.